As I scan and archive photographic prints I want, at a minimum, to note that they have been scanned and when. I may wish to note some of the subject or photographer information. I have the same objectives for recent prints, for example from the portrait studio. The first part of the problem is that modern papers are coated with something that is very difficult to mark. It is matte finish, but slick enough that an HB mechanical pencil will not leave a visible line, even though it makes an impression in the paper. The second part of the problem is that the really well-reputed pigment ink pen, the Sakura Pigma Micron, never dries. I have read that some pens’ ink reacts with the paper, binding to the cellulose. This reaction presumably causes the ink to stop being liquid. I think that Sakura pens, and many others, are in this class. The coating on the back of the photo prevents ink from absorbing, and therefore from reacting with cellulose. I believe the high-value fountain pen inks, like Noodler’s, are in this category. I have seen recommendations for Creative Memories Photo Marking Pencil, and for Stabilo Wax Pencil, and ProMaster Photo Marking Pen. I have not found these locally or on Amazon, but am interested in them. There is no official or IEEE standard for what “archival” is. So, anything labeled “archival” means that the manufacturer has, well, labeled it archival. As a result, I look for an archival product that has a history, and that has a good reputation. These are weak criteria. Another issue—one the manufacturers must struggle with—is that ink interacts with its substrate. The same ink may perform differently on 100% cotton paper than it does on buffered wood pulp paper. 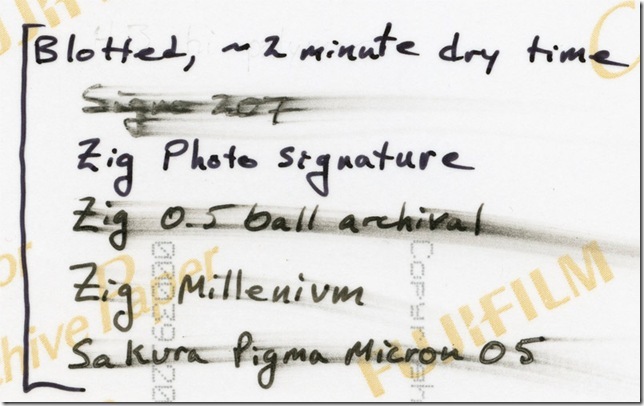 How many manufacturers test on the back of coated photo papers? One note, Sharpies are not sufficiently archival for me. I have personally seen them create a yellow hallow around the writing in just a few years. Uni-Ball Signo 207, which contains security ink. I believe security ink binds to paper chemically. Zig Photo Signature pen, which is not a pigment ink pen. This pen dries almost instantly, like a Sharpie. It even smells like a Sharpie. Presumably it fades like a Sharpie. I hope that it doesn’t age to fuzzy yellow like Sharpie. 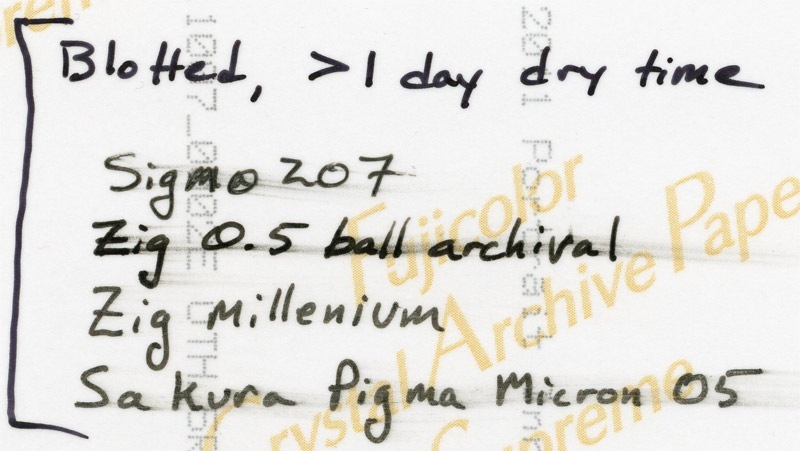 Zig Ball 0.5 mm Archival is a typical roller pen, in most ways similar to the Pilot Precise v7, but without the needle tip. Zig Millennium is a pigment ink, archival pen. 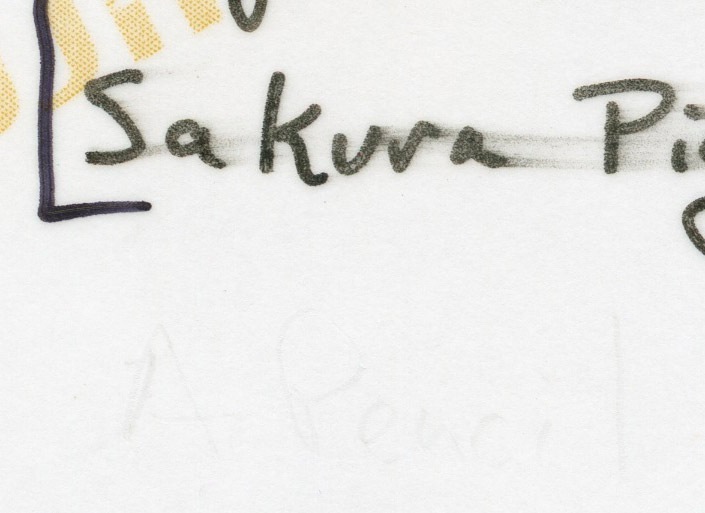 Sakura Pigma Micron pen is an archival pigment ink pen that is well loved by Internet sources. I wrote on the back of a picture, and on finishing writing I took my finger and swiped along the writing. Except for the Zig Photo Signature, all of the pens smeared. I wrote two test sets again, using the pens that smeared, then blotted one set with a clean coffee filter. I left the photo exposed for 24 hours and then swiped with my finger. The results are quite clear. One pen was worth further testing; the Zig Millennium actually dried overnight. I tested it with a timed smear for up to 2 hours, and found that it requires a multi-hour dry time. 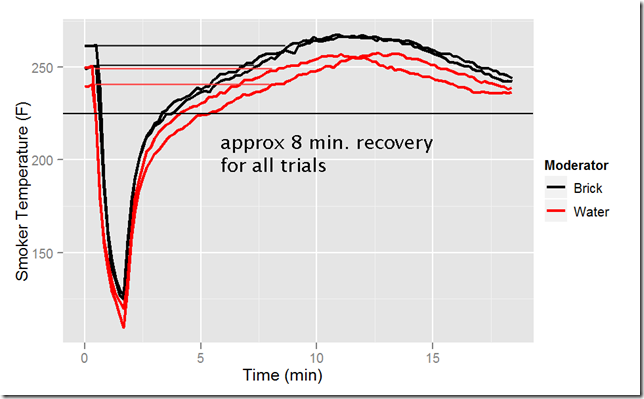 These timed tests were not blotted. For photos with absorbent paper backing, use the Sakura Pigma Micron, which satisfies all requirements. 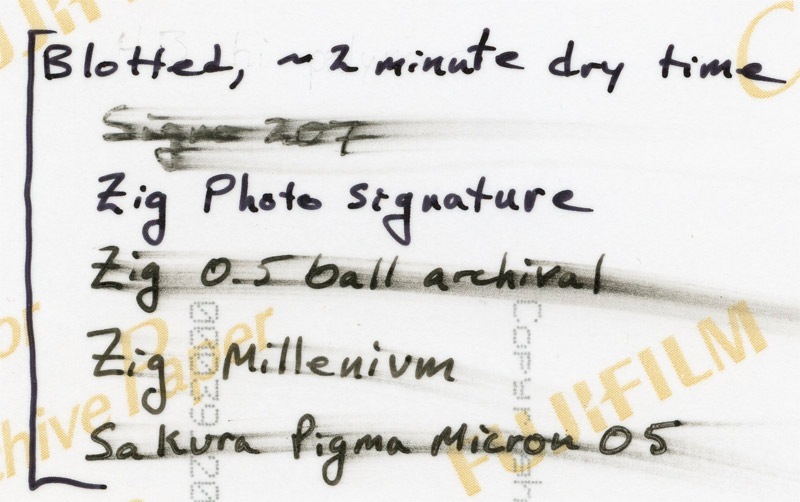 For slick-backed photos use the Zig Millennium, but blot and allow to dry overnight. An acceptable substitute may be the Zig Photo Signature, though I am concerned it will behave like a Sharpie over time, and that would be a bad outcome. It does mark beautifully and dries almost instantly. Oh yes, an example of ordinary pencil…utterly useless. I wrote “A Pencil” below. It is shocking how little information is available on these pens. I have not been able to find a single set of accelerated aging test results for these pens. And I can find essentially nothing demonstrating these on the backs of photographs. I have smoked ribs about four times in the last couple years. I’ve been fortunate enough to have my father’s MasterBuilt smoker. It is a box about the size of a dorm fridge, and can readily smoke two racks, each cut in half. It has electronic temperature management and is well insulated. I’m fond of the smoker, and totally committed to the ribs from it. At the bottom of the smoker is a pan, like a porkpie hat upside down. MasterBuilt’s instructions say to put water in the pan. Other sources suggest putting something solid in the pan instead. The argument is that boiling water is around 212°F (205°F at my altitude), and that the smoker’s temperature will not rise above that. A very reasonable argument. Consequently, I have used bricks wrapped in aluminum foil in the bottom of the pan. What does the thermal mass do, whether bricks or water? One idea is that it causes the temperature to be more even, especially for it to bounce back faster after the door has been opened. For this to work well the thermal mass should a) be quite conductive, and b) have a high specific heat. Conductivity makes the heat inside the mass available to the air in the smoker. High specific heat means that a modest amount of mass can hold lots of heat. It is hard to beat water for specific heat, and convection within the water pool should make the effective conductivity much higher than the intrinsic conductivity. Which thermal mass provides faster temperature bounce back? It turns out they are functionally identical. The following figure shows four trials, two with water and two with brick moderator. During each trial I held the door open for one minute. 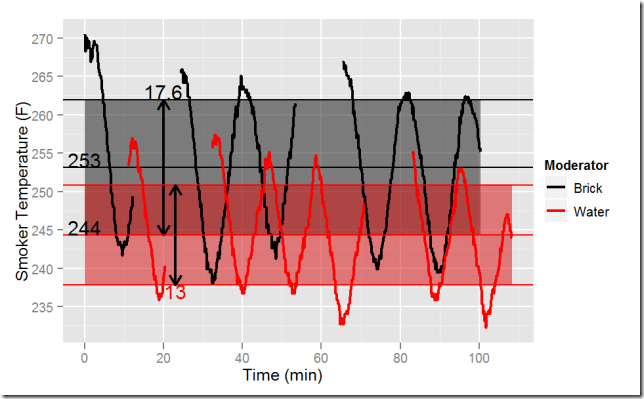 There were differences in breeze and in ambient temperature (not analyzed). 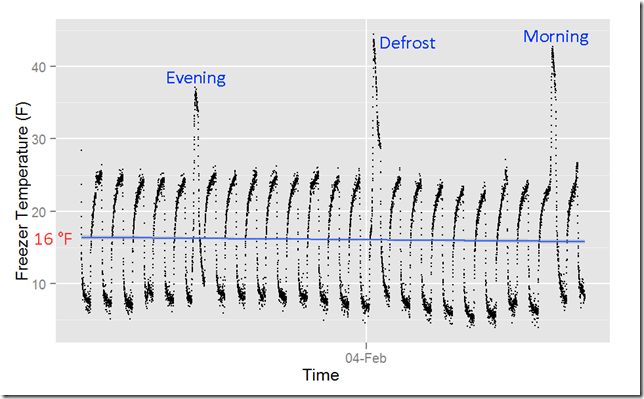 However, the chart shows that in all cases the temperature returned to its pre-opened temperature in the same amount of time, around 8 minutes. Rebound time is not much affected by the choice of moderator. Which thermal mass provides more even temperature? This is harder to measure because I opened the door for the rebound test. 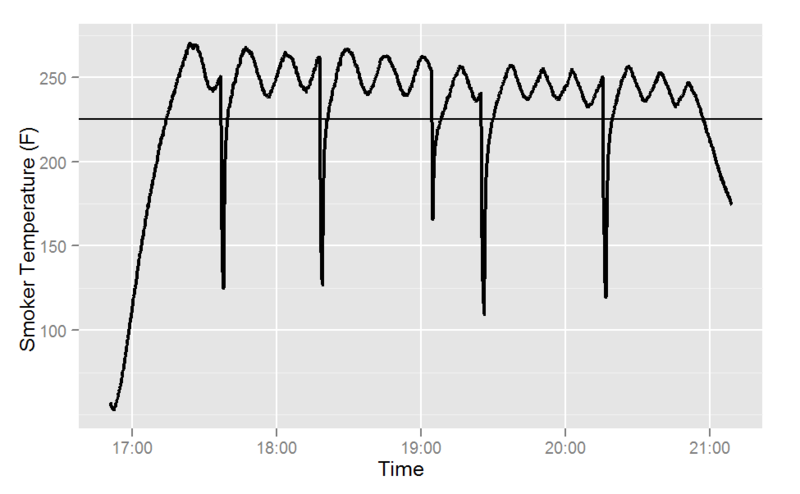 Nevertheless, by removing the open-door data I can see the thermostat’s temperature management wave, and estimate the variability. The next figure overlaps these two sets. In both sets the temperature swing is quite high, either 13°F or 17.6°F as measured by twice the sample standard deviation. Water provides more even temperature, but one that still varies quite widely. The chart reveals the tie-breaker fact: the average water temperature is almost 10°F closer to the thermostat’s set point. The set point is 225°F, as recommended for ribs. The thermocouple was positioned at the top 1/4 of the cooking chamber, in the center front/back and left/right. This is where the top slab of ribs goes. Presumably the bottom half of the cooking chamber is cooler; rotating the food top-to-bottom may help. 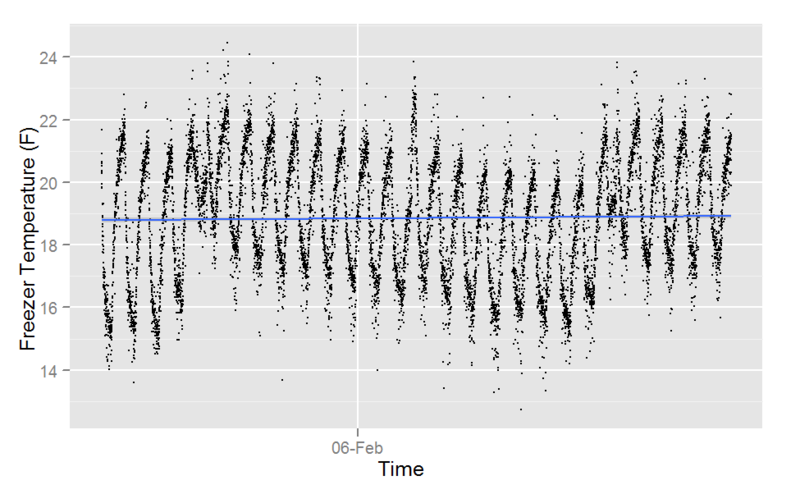 The full data record is plotted in the final chart. The warm-up and cool-down bracket the data set. The record started with brick moderator, until about 19:05, when I replaced the brick with boiling water. The deep dips in temperature come from opening the door. 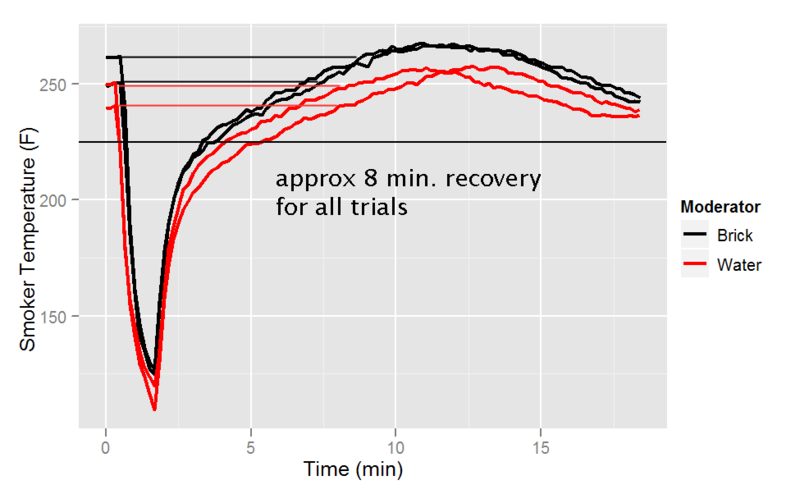 The next experiment is to instrument the box at several heights in the column, but that is low priority. Spring is coming and pruning must be attended. I turned the freezer up to 7. I’m sure yours goes to 11, but I am not so lucky. After being turned up to 7, the resulting mean temperature is still too high at 18.8°F. And with that, we bid adieu to our refrigerator. It is around 20 years old—no way to be sure, and it has had a good life. I suppose the EPA would frown on a Viking funeral? As a final check, I tested the thermometer by running it from a stirred ice bath up to a rolling boil. The ice bath temperature, averaged over about 1 minute, is about 33.1°F. A 1°F error does not present any problems. Calibration in an ice bath is quite easy, but calibration at boiling is not. 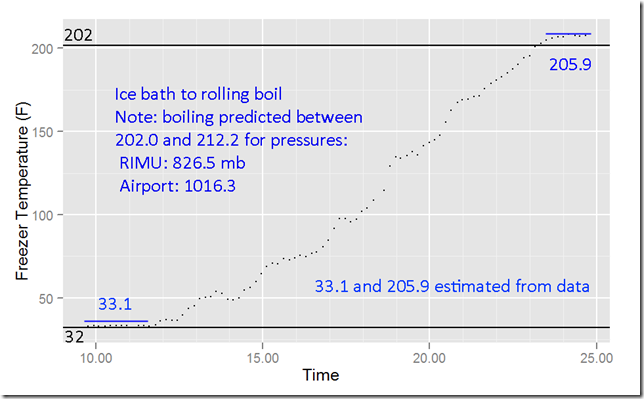 The pressure estimated from the RIMU predicts a temperature below the measurement, while the local airport’s barometric pressure predicts one above. In any case, the error is a few percent or less. The last few weeks our ice cream sandwiches have been awful. I’m throwing away ice cream sandwiches, and I’m only marginally pickier than my dog. They’ve been gummy, almost squishy. We have been suspicious of the refrigerator since we smelled a hot electric odor—like burning dust. I monitored the fridge with the RIMU, and it looked more or less reasonable. I monitored the freezer too, for one night. It is looking less good. In addition to the short-lived odor, there is another reasons to be suspicious. 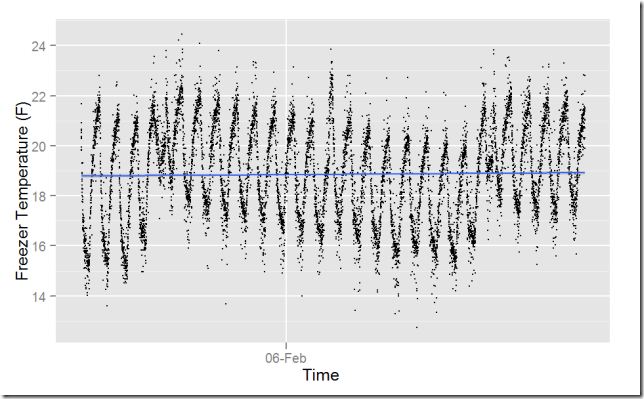 The fridge gets warm on the outside, notably warmer than it used to. 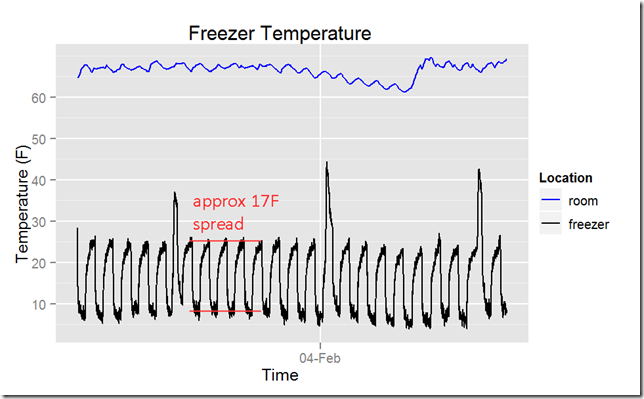 Normal fluctuation in freezer temperature should be about 5 degrees, measured with a mass-damping technique…that I did not employ. I estimated the air temperature variation, not the food temperature variation. The air temperature variation is larger. The air temperature swings through a larger range than I would expect. The average temperature, though, looks altogether too high: 16°F. The normal target temperature is 0°F. 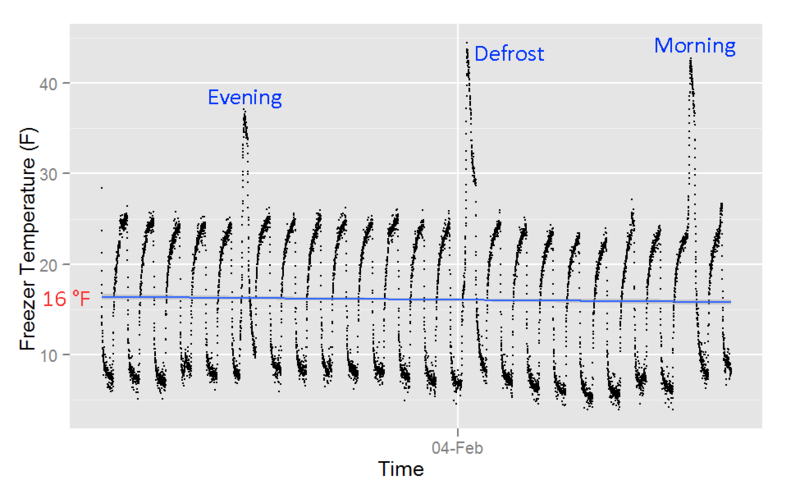 I’m assuming some of the spikes are because we were accessing the freezer, but they may all be defrost cycles. 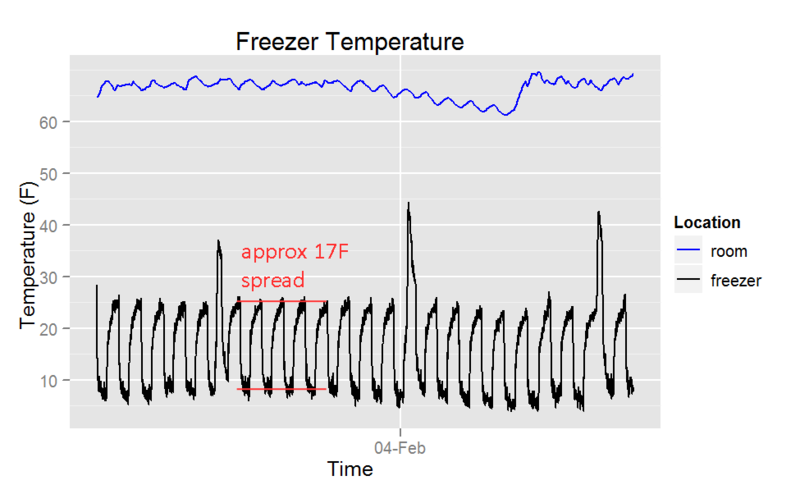 We’ll continue fiddling with the temperature control, but likely the freezer is singing its swan song. That’s one note, about 0.25 millihertz. Heat Less with Better Blinds? Evidence is mounting that closing the blinds can reduce the rate of heat decline—at least when the wind is mostly still. 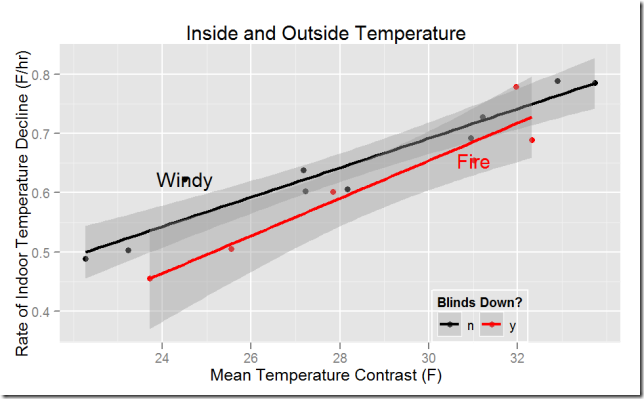 The figure compares the heat loss rate to the indoor-outdoor contrast. Higher rates are bad. Closing the blinds keeps reduces the temperature loss rate by about 0.1 degree F/hour. 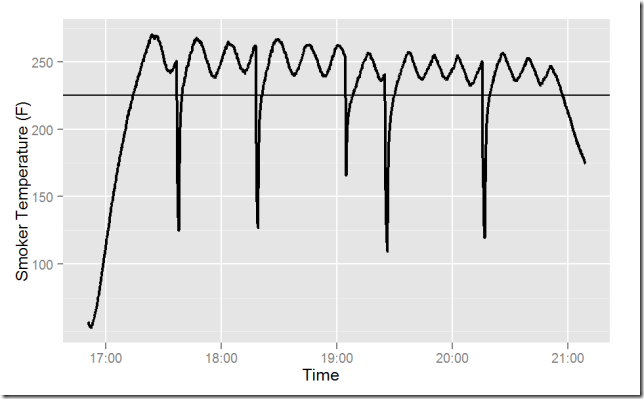 Integrate that loss rate over the course of the night and closing the blinds keeps the house 1 degree F warmer. To keep the house 1 degree F warmer by turning up the thermostat 1 degree F during the night would increase energy use about 1%. This could save as much as 3% on the heating bill according to many sites who uniformly cite miserably. My gas bill is about $70/month during the winter, assuming 4 months, I’ll save $8.40 per year by closing the blinds. This should pay for the blinds in only a little over 120 years. I’ll continue collecting data, and may update this if the results change. Your mileage may vary. Posted on February 2, 2012 Categories MakingTags Arduino, Electronics, Home Temperature1 Comment on Heat Less with Better Blinds?